We are Greater Portland’s “Go-To” auto body shop and have been for over 30 years. Harbour Auto Body specializes in high quality collision repair for all makes and models of foreign and domestic cars, vans and light trucks. Our highly-trained professionals handle everything from minor dings, dents and scratches to major frame and collision repair. 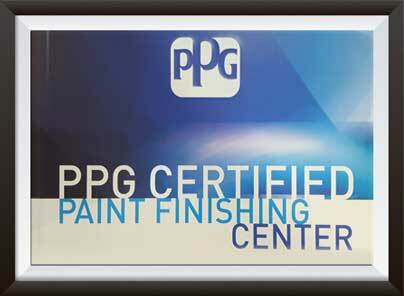 Our color matching, paint and finish work is second to none. Everyone here at Harbour Auto Body takes great pride in our attention to every detail and making your experience stress-free and enjoyable. Yes – we offer very competitive rates and handle all insurance claim handlings. Count on us to get your vehicle “Back to Beautiful” quickly and affordably. We will work with your insurance company to ensure everything is repaired properly and expeditiously. Estimates are always free and no appointment necessary. Unable to safely drive your vehicle? We’ll arrange towing. Harbour’s professionals offer aluminum repair work. Prior to the introduction of the 2015 Ford F150, aluminum was only used as a primary body material on limited production vehicles like Range Rovers, Jaguar XK sedans, Audi A8s, and certain Mercedes-Benz models. Accordingly, aluminum repair expertise was usually limited to a few high-end collision centers. The F150, on the other hand, is America’s best-selling vehicle, with about 700,000 units sold each year. This huge volume translates into an increased demand for qualified aluminum collision repair operations. We repair body damage to all types of vehicles. A vehicle’s frame or a vehicle’s unibody acts as a supportive base where other automotive components attach. Frame: In some cars, the frame is separate from the vehicle’s body. Different types of frames exist for different vehicle makes and models, such as C-shape, boxed, and hat. In car construction, the term “body-on-frame” refers to the practice of mounting a vehicle to its frame. Unibody: Popular and found in most vehicles today is unibody design, where the frame and body of the vehicle are one piece. Harbour Auto Body ensures all body work is done to exacting manufacturer’s specifications. Many accidents and “fender- benders” are easily fixed. We do a lot of bumper and plastic repair on today’s vehicles which make use of more forgiving materials. Harbour Auto Body’s two high-tech, down-draft paint booths are extremely busy. It is here that magic happens. We take great pride in offering full auto body painting, exceptional color matching, spot painting and clear coating for all makes and models of cars and trucks. “Back to Beautiful!” is more than a tag line. It has been our mission for over 30 years. We’ll make your vehicle look brand new again. No matter how large or small the job, let us transform your car or truck with professional painting. Whether you need a touch up from a scratch or a clear coat for protection, you can be assured of a perfect finish. Certain accidents involve extensive damage. When collision repair is correctly done, the repair brings the car to the same specifications in look and safety that the vehicle had when it was originally built. An accident will distort the shape of the car, so we start by taking the vehicle apart and getting its chassis back to original specifications. We then replace or repair any part that is damaged. Since our foremost concern is for your safety, we don’t use low quality, after-market parts, but only parts that pass all factory standards. Any rusted parts are also replaced. Parking lot mishaps, in-town fender-benders, etc.- just seem to happen. We’ve seen it all and we fix them all, so no one would ever know. Voila! Back to beautiful! We repair dents, dings, scrapes and scratches that come from minor bumps, run-ins and accidents. We’ll straighten everything out and our exceptional color matching will leave it looking like nothing ever happened. Our experienced welders can retrofit steel parts, repair metal cracks, repair auto frames, custom fabricate certain parts and much more. When you need welding services for your car or truck, we can handle it. Please don’t hesitate to call or e-mail if you have any questions about the services we offer!